Adam walked away with no one. Hmmm, does this mean that Adam’s “four chair reign” has come to an end? 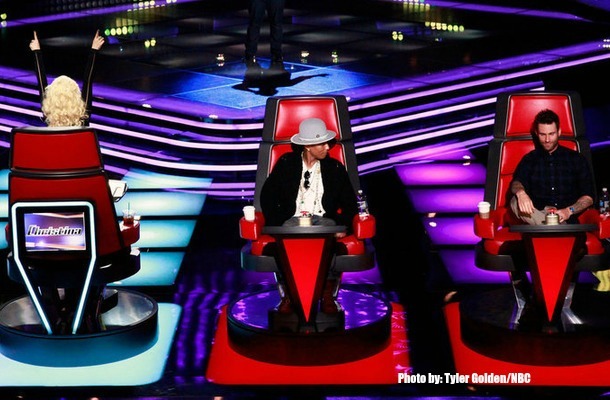 Last season…THE VOICE Season 8 Premiere Blind Auditions Recap. NBC’s singing competition premiered it’s eighth season of “The Voice” welcoming back veteran host Christina Aguilera and returning new host Pharrell Williams joined by the other two veteran hosts Adam Levine and Blake Shelton, or “Shevine”! The show’s first round, the Blind Auditions, gives singers the chance to display their talent in front of the celebrity coaches with their backs turned, using only their ears. In night one, Pharrell captured three singers for his team. Christina won over two, and Blake charmed three artists while his nemesis Adam walked away with no one. Hmmm, does this mean that Adam’s “four chair reign” has come to an end? Last season, Adam deemed himself as the “King” of the four chair turns because out of all four coaches turning their chairs for artists, that artist would chose Adam for a coach almost every time. Rob sang Luke James’ “I Want You,” and Christina could hardly contain herself throughout his performance. As the applause dies down, Christina jumps out of her seat to hug Rob before he can even get his name out. Adam and Pharrell put up a good fight for Rob, but Christina’s enthusiasm had struck a chord with Rob. Treeva sang Lana Del Rey’s haunting hit, “Young and Beautiful.” Blake tells Treeva he’s the right fit for her, but girl power ultimately wins, and Christina convinces Treeva that she can perfect her “smooth texture” vocals. Sarah’s cover of “Stay with Me” had all the coaches buzzing in for her. 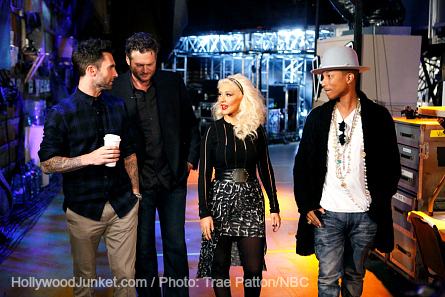 Adam and Pharrell literally beg Sarah to join their teams, but she ultimately makes the unexpected choice of Team Blake. Can’t deny that Nashville connection. Cody’s cover of “He Stopped Loving Her Today” had Adam wanting Cody from the start and pushes his button early on. After a standing ovation, the coaches start their squabbling. Adam says even though he doesn’t wear a cowboy hat, he’d be a great match for Cody because “truly brilliant voices transcend all genres.” Pharrell tells Cody he’s unique and that perhaps he could actually teach him. Christina tells Cody she knows true talent when she hears it, and would love for Cody to give her a chance. Adam, Pharrell and Xtina all plead Cody to be unpredictable, but when it comes down to decision time, Cody sticks to his country roots and picks Team Blake. Joshua sang Bob Dylan’s “I Shall Be Released” and Adam loves Joshua’s bluesy tone, But wait, Blake interjects – shouldn’t the victory be the artist’s alone? Probably not Adam’s smoothest line… After some consideration, Joshua picks Team Blake. Lowell sang “Don’t Get Around Much Anymore.” Despite Adam’s heartfelt appeal to the 19-year-old old it’s Pharrell who nabs him “You’re not regular, you’re not the same, you’re other,” Pharrell tells Lowell. Meghan sang Nazareth’s “Love Hurts.” Blake, who doesn’t turn his chair for Meghan, is shocked – he and Meghan toured together years ago! He endorses her as one of the best singers he’s ever heard in his life and leaves it to the other coaches to battle it out. Christina declares she’s Team Meghan – forget Team Christina! Adam praises Meghan and explains how he can make her even better. Pharrell who has the gilded tongue, told Meghan he senses her soul. And with that, smooth talk wins again and Meghan choses Team Pharrell. Sawyer sang the Soggy Bottom Boys’ “I Am a Man of Constant Sorrow” and has three judges turned around three seconds into his performance of and soon after Blake turns around as well. Sawyer has his pick of all four superstar coaches. Adam pleads to Sawyer, “I don’t know if you have your mind made up already… but if it’s not me, I’m going to change your mind.” Blake and Xtina make their pleas, too, but it’s Pharrell who charms the kid. “You took me to another time,” he says. Sawyer choose Team Pharrell. As a street performer, Anthony thinks that it has prepared him to move on to bigger and better things. His dad advised him to go sing in the train station. Anthony said, “loving what I do makes it easier to let people in.” He fought for the rights for street performers to be allowed to perform in the park. He sang “I Feel Good” by James Brown. Coaches Comments: Blake told him that he had him at “Ah!” Blake also complimented him on his dance moves which Blake took credit for. Christina said he makes her feel glad to be back on “The Voice.” Adam said the hardest thing to do is to “stay hot throughout the competition,” and that he has a plan for him. Blake said Christina and Pharrell are like putting water with water. But Blake would be like putting Whiskey in water. He chose PHarrell. Mia comes from a strong family musical background an is a fifteen-year-old with her own band Her father said Mia has the same thing that Christina Aguileria has. Christina is the coach that Mia said she wants. She sang “The Thrill is Gone”. Gabriel describes his singing style as “Indy Folk.” He said his whole family chose their names. Christina took it home when she told him, “you sold your performance with your instrument. You’d be one of a kind for me. I would cater your sound,” and also added that she’d take him “there”. Gabriel told Pharrell that he would have picked him had he turned his chair. Gabriel chose Christina. Coaches Comments: Christina showed Joe her high note as he hit his high note. She said they can do great things when Joe told her he wants to sing soul. Blake said he’s not going to brake-out in a tune because this is not Grease, this is “The Voice” Christina called Blake “tired.” Joe selected Christina for his coach. Brooke, who is sixteen-years-old, performs at Italian and Mexican restaurants. She sang “skinny Time.” Her family moved from Georgia to Florida due to her mother’s Lupus disease. Blake said he loves her pitch and yodle He told her he’s looking at a future star. Brooke told Adam and Blake that they remind her of “Tom & Jerry.” Adam told her, “That’s an amazing performance.” Be also said, she is emotionally connected and passionate. Pharrell said he didn’t push his button because he’s intrigued, and didn’t want to step on Adam and Blake. She picked Blake. She’s from New Orleans and got a degree in music education. At age 35, she said she hasn’t given-up on her dream of singing. Tonya works with the prison choir made-up of inmates who are ready to go home. She’s been singing professionally since the age of 16. Tonya lost everything, including her baby’s pictures in Hurricane Katrina. She sang “Happy” by Pharrell Williams. Christina said she got lost in it because sh was having so much fun listening to her. Pharrell said, “You started taking chances and those are the people that really do it for me.” He said it would be “awesome” to work together All Adam had over on the other coaches was 15 seconds. His argument was that it makes no sense to go with Adam, so he thinks that she should. Tonya chose Adam she said because she likes his risks. Coaches Comments: Adam told Blaze that it’s the coolest name that he’s heard in his life. Pharrell told Blaze that he’s different. Blake said if Blaze makes it one day, he can be his own security guard because he’s big. Adam said he wants Blaze on his team because he “exists outside the box” and doesn’t fit the mold. Blaze chose Adam. Deanna auditioned for “The Voice” during season four. Coaches Comments: Adam said he is so over-joyed that someone came back who got no chair turns, and now has four, Blake told Deanna that he thinks she is a star and she doesn’t “want to go with the little people” referring to the other coaches. Christina told her that she came out and “owned everything” and was very believable Adam said “It is that people that like to hear it that are the ones that will go the distance.” Deanna chose Adam. Adam did a victory dance in front of Blake while Blake sat in Adam’s chair. Coaches Comments: Blake said “I think you’re a solid country singer. But, when Merle Haggard sang that song, it sounded like he had just worked all day.” But Drew turned it into a party song Christina said he didn’t push it enough. Pharrell said it’s about connecting with people emotionally. He’s thirty-nine years old. He was raised by a single mother. At one point, his family was homeless and lived in a tent in the woods. Bryan works in construction by day and does karaoke by night. He sang “Rocket Man” by Elton John. Coaches Comments: Blake said “there was some amazing moments and some shaky moments.” Christina said his falsettos kept falling short. Pharrell basically being turned-around in the chair, they are able to see what’s “special” about him.